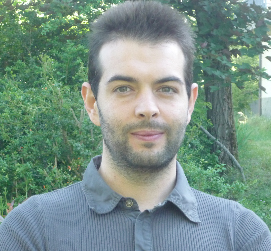 Marco Natali is carrying out a PhD in Information and communication technologies (ICT) at the University of Modena and Reggio Emilia (UNIMORE) and at the CNR-ISMN of Bologna under the supervision of Dr. Michele Muccini and Dr. Stefano Toffanin. He received his Bachelor's Degree in Electrical Engineering from the University of Bologna with a thesis entitled 'UV sensors for the detection of DNA' under the supervision of Dr. B. Riccò (2008). After two years he obtained the Master Degree in Electrical Engineering at the University of Modena and Reggio Emilia with a theoretical orientation focused towards the design and characterization of advanced photonic devices. The work of master thesis, entitled 'Advanced Multifunctional Devices based on Organic and Hybrid Nanostructures', under the supervision of Prof. Luca Vincetti and Dr. Stefano Toffanin, was carried out directly at the laboratories of CNR-ISMN (final grade 107/110). During the specialization he won an Erasmus scholarship so he completed a period of study at the Technische Universiteit Eindhoven / Eindhoven University of Technology (TU/e) with an internship project entitled "Optical nanocavities for telecom-wavelength single-photon emitters" under the supervision of Prof. Andrea Fiore (2009). His current research interests are mainly focused on the fabrication and study of Organic Field Effect Transistor (OFET), Organic Light Emitting Transistor (OLET), fabrication and characterization of photonic nano-structured organic-inorganic hybrid systems for lasing (dye laser-organic), biocompatible devices for bioelectronics. Susanna Cavallini, Stefano Toffanin, Camilla Chieco, Anna Sagnella, Assunta Pistone, Tamara Posati, Marco Natali, Valentina Benfenati, Nicola Di Virgilio, Giampiero Ruani, Michele Muccini, Roberto Zamboni and Federica Rossi “Naturally Functionalized Silk as Useful Material for Photonic Applications” Proceeding at 4th Conference on Natural Fibre Composites, Rome 17-18 October 2013.